DCK Investor Edge: Annual report by North American Data Centers lifts the curtain on the largest cloud platforms’ server farm leasing activity. Non-disclosure agreements between data center landlords and their largest customers make the job of discerning what exactly the biggest data center users are up to in the market difficult. North American Data Centers' annual report on the largest leases, authored by the commercial real estate brokerage’s principal and co-founder Jim Kerrigan, unmasks most if not all of the previous year’s biggest deals. If you follow the data center industry, you know that Northern Virginia continues to rack up new leasing records year after year. The latest NADC report confirms that the six largest data center leases of 2018 were all signed in Northern Virginia. It reveals that leasing activity for deals of 2MW-plus in Virginia totaled a whopping 232MW – more than two and a half times the leasing volume in all other US markets combined last year. And, these “net-absorption” estimates do not include a significant number of powered shells being developed in the region on behalf of Amazon Web Services. The unprecedented level of activity in Northern Virginia "to some degree has sucked the air out of other top-tier data center markets," Kerrigan said in an interview with Data Center Knowledge. Atlanta, for example, was a market where demand in 2018 did not appear to keep pace with all the big data center developments announced there over the last 18 months or so, he said. Many of those projects, however (proposed by CyrusOne, Switch, and others), have progressed slowly, limiting the amount of new supply, he said. Facebook and Microsoft were by far the year’s largest customers in Northern Virginia, accounting for 97MW and 74MW, respectively. Salesforce provided 38MW of additional demand in the region. Facebook last year signed what appears to be the largest data center lease of all time – a whopping 72MW – in Ashburn, Virginia, with privately-held operator CloudHQ. 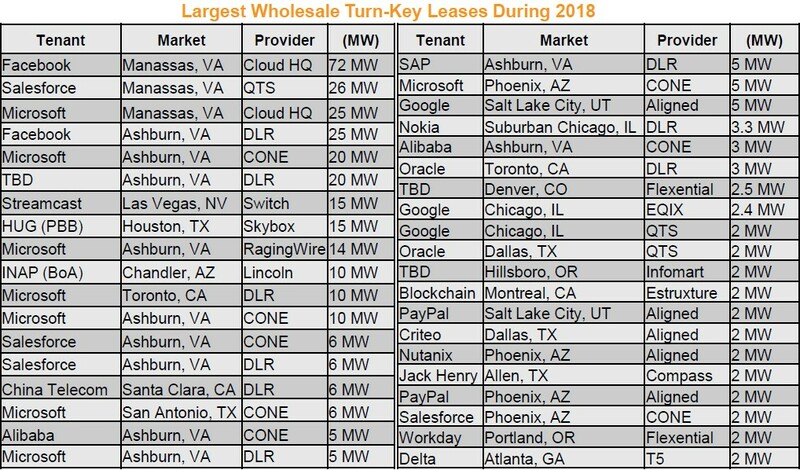 This single lease appears to be larger than any aggregate leasing by one company during 2018 in any other North American data center market. Facebook also signed a 25MW lease in Northern Virginia with Digital Realty Trust. CloudHQ landed another big lease in 2018: a 25MW commitment from Microsoft, which also signed a 20MW lease with CyrusOne and a 14MW lease with RagingWire; QTS Realty got Salesforce to sign a 26MW lease; and Digital leased an additional 20MW to a customer the report did not name. There were a few large deals that made up the lion's share of the $3.84 billion of acquisition activity outlined in the NADA report. Brookfield Infrastructure's $1.1 billion purchase of the AT&T data center portfolio led the way. The Equinix purchase of the Dallas Infomart for $800 million was a close second. (Notably, the NADC report does not include some of the bigger international deals, including Digital Realty's joint venture with Brookfield to purchase Ascenty in Brazil and the CyrusOne purchase of Zenium in Europe). In Kerrigan's hometown of Chicago, leasing demand was relatively anemic during the year. The largest leases were just 2.4MW and 2MW, signed by Equinix and QTS, respectively. The high cost of doing business in the area (utilities, land, labor, taxes) may have contributed to the slowdown. It remains to be seen if Chicago wholesale leasing is cyclical and will bounce back. EdgeCore CEO Tom Ray, for example, told us last year that his company no longer had the land parcel in the Chicago market it used to have under contract to build a new wholesale data center campus. The explosion of hyperscale leasing in Northern Virginia is only part of the hyperscale buildout story. In addition to leasing, hyperscale cloud platforms are all building massive data center campuses of their own. Kerrigan said he believes a shortage of critical electrical and mechanical equipment from major suppliers may impact where new leases will be signed in the future. Many of the large publicly traded data center REITs and deep-pocketed private firms have negotiated multi-year supply chain agreements that lock in prices and delivery schedules. This may give these large players a crucial advantage when it comes to de-risking a move-in date for a large customer, Kerrigan said. Savvy investors are always looking for an information advantage. Having a greater sense of which companies are doing business with each other can help connect the dots, especially when combined with other publicly available information contained in SEC filings and investor and industry presentations. After publicly traded REITs reported bookings for the first half of 2018 it became evident that net-absorption of space in Ashburn’s “Data Center Alley" and the surrounding counties would blow away the previous year’s 115MW leasing record reported by international consulting and brokerage firms such as Jones Lang LaSalle and CBRE. Those detailed market reports are long on statistics but usually light on transaction details due to global client non-disclosure agreements. The NADC report goes a long way toward helping investors connect those dots. A previous version of this article incorrectly reported, using NADC's report as the source, that Facebook's 72MW lease with CloudHQ was in Manassas, Virginia. A different source familiar with the site told DCK the lease was actually in Ashburn, and the article has been corrected accordingly.